Her unfathomable magnetic charm and her captivating screen presence both will leave you in awe! She is the 'jawan Sheila' of Bollywood and Barbie for the fashion world! She is none other than the drop-dead gorgeous Katrina Kaif. Former model and now one of the top actresses of Bollywood, Katrina is a British citizen working in India on an employment visa. Her fresh, unconventional look was immediately accepted and appreciated by the Indian audience. Although her first film 'Boom' bombed at the box office, it helped her grab good roles in Namaste London, New York and Rajneeti, and her performance was appreciated in films. Kat had a tough time making a mark in the Hindi film industry owing to her British accent but nothing seemed to deter her. Been voted the sexiest Asian woman in the world consecutively for four years by Eastern Eye, she is also the most photographed woman in India and the most searched celebrity according to Google's data for the last three years. The Cancerian's personal life too is always in the limelight - sometimes being called Salman's girlfriend and sometimes as Ranbir's arm-candy. Juggling between glamour and controversies, Katrina will be turning 28 on 16th July. Ganesha, with the help of Vedic Astrology, studies her birth chart to find out her future. Katrina will be under the influence of Saturn Return after November 2011. She is currently under the influence of Rahu Ketu half return. Transiting Jupiter is in opposition with Natal Mars and exalted Saturn. 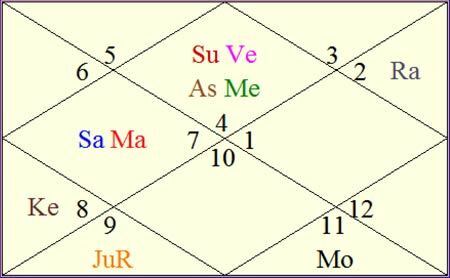 Considering all the planetary transits over Katrina's Natal planets, Ganesha feels that she will have an average year ahead from career point of view. Although she may be in the limelight, there are chances that she may not hit the headlines very often. Katrina will now start thinking about her personal life more seriously, but Ganesha feels that she may take a little more time to decide on marriage. Third quarter of 2011 is eventful for her. Last quarter of the year may be average. She will have to avoid getting into controversies around this time. Again, first half of 2012 may be average for Katrina, but here she may receive unexpected financial gains or may be back in the limelight. May Lord Ganesha bless Katrina Kaif with good health, wealth and happiness!